This item includes free shipping, handling, and insurance. Comes in a mahogany frame with linen liner and brass nameplate. "Often times our history books neglect to tell the whole story of how our nation was founded on faith in Christ. Here in Washington at Valley Forge, George Washington kneels in prayer asking God for strength for his soldiers to make it through the harsh winter. The war was waging but in the midst of it all, Washington stopped for prayer." 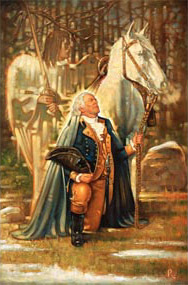 Ron DiCianni radiantly depicts Washington as the man of faith that he was and the angel behind him that protected him in war. What a magnificent reminder of the beginning moments of our nation! Washington at Valley Forge copyright© by Ron DiCianni.